Property 1: Paradise House right on the Sea !! 3 bedroom accommodation in Derveni Korinth Pelo. Property 2: 3 bedroom accommodation in Derveni Korinth Pelo. Property 6: Maria Christina' s house. Your beachfront place. MONDO COSSERI AKRATA, APARTMENT BY THE BEACH. 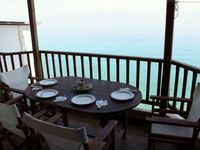 Property 12: MONDO COSSERI AKRATA, APARTMENT BY THE BEACH. EVOIKON residences are located at the borders of Ligia village. Property 32: EVOIKON residences are located at the borders of Ligia village. Nothing but infinite sea of the Corinthian gulf! 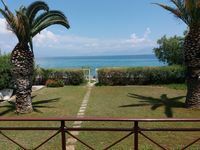 Property 37: Nothing but infinite sea of the Corinthian gulf! Country villa with view, close to important sites and beaches. Property 42: Country villa with view, close to important sites and beaches. We had a wonderful time a Mar&iacute;a Christina&rsquo;s home. She was very gracious sharing her beautiful home on the sea with us! Everything was perfect! Our group of 8 had plenty of room and the view was stunning! Die Wohnung ist im 2.Stock und nimmt die gesamte Etage ein, sie ist also wirklich gro&szlig;. In der K&uuml;che ist alles vorhanden, was man zum kochen braucht(viel Geschirr, Besteck, Sp&uuml;lmaschine etc.). Es gibt zwei B&auml;der (eins mit Dusche, eins mit Badewanne). Auf den Balkonen kann man direkt aufs Meer schauen, und untendrunter befindet sich direkt der Strand. Die Wohnung ist au&szlig;erdem wirklich sauber! Am Ankunftstag wurde uns alles gezeigt und auch sp&auml;ter konnten wir uns mit Fragen an den Verwalter wenden! Wirklich ein toller Aufenthalt! A really wonderful property! Everything, you need, is there. In the kitchen, you'll find everything you need for cooking and more than enough dishes are also there. From the balconies you can see directly the sea and the beach. The property is really big, and it was perfectly clean! The property-manager showed us everything, when we arrived and we could ask him any question also later. It was a real wonderful stay!